If there were any remaining doubts in anyone’s mind that the proposed Niagara Lodge on Goat Island in Niagara Falls State Park is earmarked for Jeremy Jacobs’ Delaware North worldwide empire, what follows should dispel them. Two images portraying the embattled hotel/resort have been posted by local economic development agency USA Niagara at its Niagara Experience Center website. 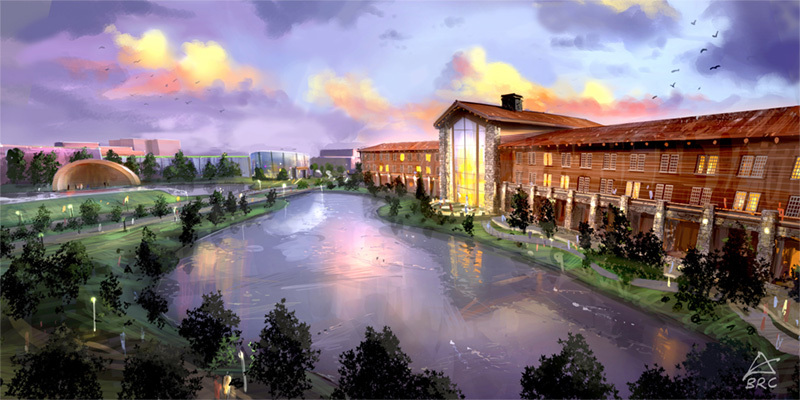 These two images of the controversial Niagara Lodge, appearing on a USA Niagara website, were created by Delaware North partner BRC (note logo on bottom right). 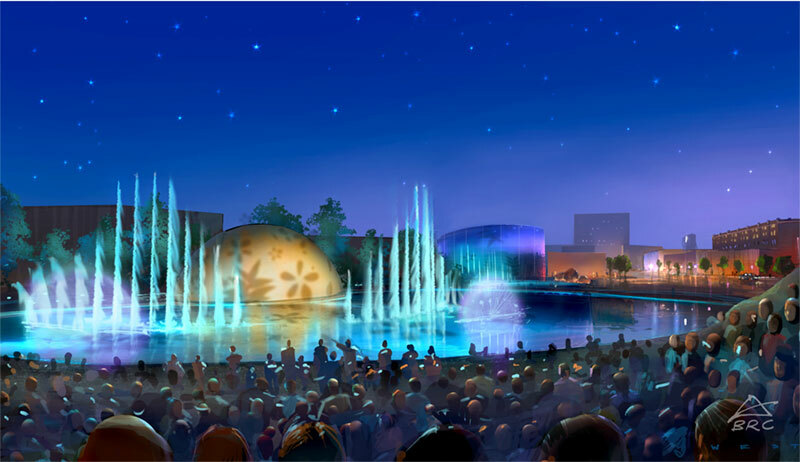 Several other images depict the Niagara Experience Center, but it’s the two hotel images that are most significant. The images were created by a company called BRC Imagination Arts of Burbank, California. Among BRC’s dozens of clients are Cleveland’s Rock and Roll Hall of Fame, the Grand ‘Ol Opry, the Cirque De Soleil, Abbey Road Studios, the Empire State Building Observatory, Knott’s Berry Farm, the Abraham Lincoln Presidential Library, Naples Botanical Garden and the Kennedy Space Center. Clearly, Niagara Falls State Park will soon be added to that list, if USA Niagara, Delaware North and BRC have anything to say about it. Members of the 41-person BRC team that collaborated with Delaware North in creating the Kennedy Space Center attraction included the following job titles: Project Manager, Creative Director/Production Designer, Media Director, Concept & Story, Concept Art Director, Music Composer, Visual Effects Supervisor, Lighting Designer, Concept Artist, Storyboard Artist, Interiors Designer, you get the idea. Twelve Delaware North staffers, 8 of which are identified as either Directors or Managers, are listed. Scores of astronauts are listed as consultants. To summarize: A subsidiary of a New York State government agency, USA Niagara, has utilized two watermarked images created by a private company, BRC, which has worked previously and closely with Delaware North to establish a major (1.5 million visitors a year) tourist attraction, the Kennedy Space Center, to promote a controversial hotel project in the Niagara Falls State Park long before any official public hearings or comment periods have been held on the matter. Delaware North, USA Niagara, or both, engaged BRC to create images of the future development in the state park. Again, USA Niagara, a government agency, on one of its official websites, slyly adopted and displayed the work of a private company with a direct interest in the outcome of the Niagara Lodge issue. Forgive us for saying so, but it certainly appears as if BRC and Delaware North are way ahead of us on this game. Was BRC paid for the two images? What else has BRC, or Delaware North for that matter, done to lock down the Niagara Lodge contract, with the behind-closed-doors cooperation of USA Niagara, that the public is, as yet, unaware of? Other than make large campaign contributions to Governor Andrew Cuomo, that is.